Mackinac Island (/ˈmækɨnɔː/ MAK-in-aw) is an island and resort area, covering 3.8 square miles (9.8 km2) in land area, in the U.S. state of Michigan. It is located inLake Huron, at the eastern end of the Straits of Mackinac, between the state’sUpper and Lower Peninsulas. The island was home to a Native Americansettlement before European exploration began in the 17th century. It served a strategic position amidst the commerce of the Great Lakes fur trade. This led to the establishment of Fort Mackinac on the island by the British during theAmerican Revolutionary War. It was the scene of two battles during the War of 1812. In the late 19th century, Mackinac Island became a popular tourist attraction andsummer colony. Much of the island has undergone extensive historical preservation and restoration; as a result, the entire island is listed as a National Historic Landmark. It is well known for its numerous cultural events; its wide variety of architectural styles, including the famous Victorian Grand Hotel; itsfudge; and its ban on almost all motor vehicles. 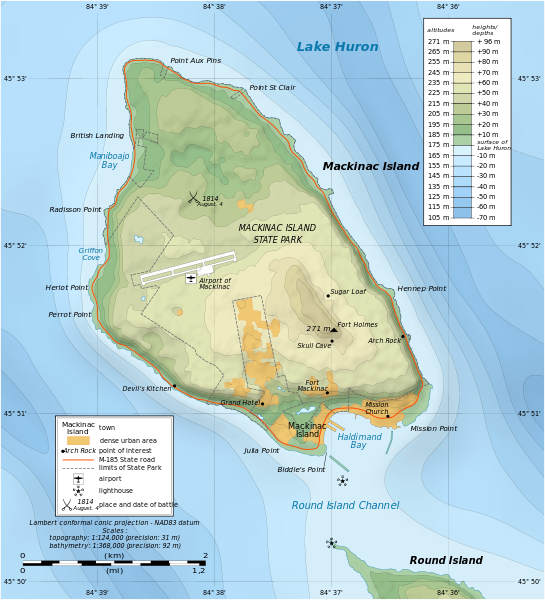 More than 80 percent of the island is preserved as Mackinac Island State Park.